LAKE SUCCESS, N.Y., November 15, 2011 – Canon U.S.A. Inc., a leader in digital imaging solutions, today announced the imageFORMULA P-215 Personal Document Scanner. Expanding on Canon's award-winning imageFORMULA product portfolio, the P-215 personal scanner's compact size and high-quality imaging bring sophistication to mobile information capture, storage and collaboration. Its innovative design and excellent value make it ideal for use by "road warriors" and office users looking to improve personal efficiency and productivity. "The Canon imageFORMULA P-215 Personal Document Scanner is the latest addition to Canon's growing line of mobile scanning products, including the successful P-150 Scan-tini personal document scanner," said Jim Rosetta, vice president and general manager, Imaging Systems Group, Canon U.S.A. "The combination of simple use, high-image quality and a built-in card scanning capability in such a compact footprint make this solution ideal for office users and mobile professionals in healthcare, financial services, government and other areas looking to take document capture beyond the walls of the office to the convenience of any location." The new Canon P-215 personal scanner reflects Canon's imageANYWARE capabilities, helping to create a flexible corporate culture, allowing employees to work virtually any time or anywhere. The P-215 measures only 11 inches long, weighs just over two pounds and incorporates an automatic document feeder (ADF) in a sleek design. To complement the ADF, this scanner also includes an integrated card scanner, capable of handling plastic ID cards, driver licenses and embossed cards. 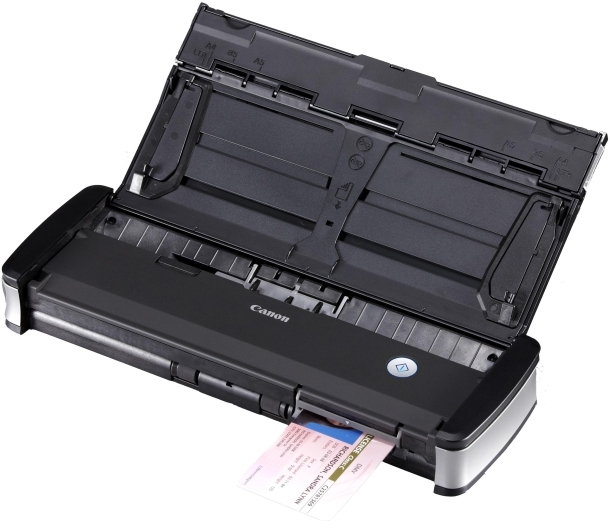 Using electrical power via a single USB cable, the P-215 scanner can scan a batch of up to 20 documents at its maximum scanning speed of 15 pages-per-minute (ppm)1 in color or black and white and yet still easily fits into a briefcase for portable and mobile users. For exceptional image quality, the scanner also includes features such as Character Emphasis and Auto Resolution to improve the legibility and clarity of hard-to-capture documents. 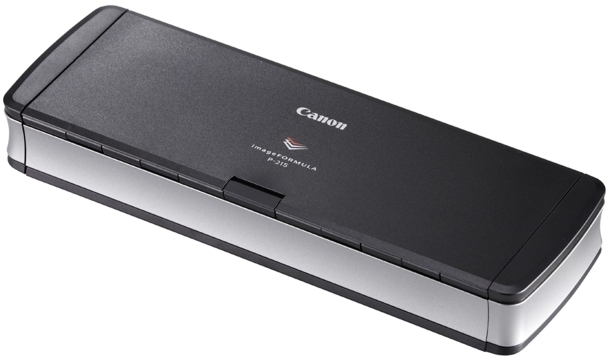 The Canon P-215 scanner launches Canon CaptureOnTouch Lite immediately upon connecting to a PC. This "Plug-and-Scan" capability allows users to initiate scanning without installing drivers or applications. The scanner is also bundled with CaptureOnTouch, which enables users to scan directly to select cloud applications such as Evernote, Microsoft SharePoint, and Google Docs, further improving accessibility to information and collaboration. For added convenience, the P-215 incorporates Windows ISIS / TWAIN drivers and a Mac TWAIN driver (industry standard interfaces for seamlessly linking applications and scanners) for easy integration with third-party document capture, document management, or Enterprise Content Management (ECM) applications and easy device sharing between Windows and Mac users. The new imageFORMULA P-215 personal document scanner is available immediately through all authorized Canon resellers for a manufacturer's suggested retail price (MSRP) of $325.3 For investment protection, eCarePAK options are available from Canon. eCarePAK extends service beyond the initial one-year limited warranty period, saving on costs associated with post-purchase maintenance and maximizing uptime throughout the product life.